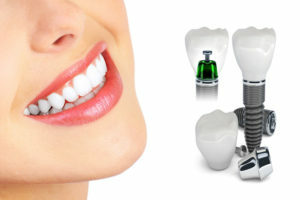 Modern dental implant is titanium screw that is spinned in to the bone of the jaw and is combined with it, and serves as a replacement for the root of the lost or the missing tooth. Dental implant is an ideal option for patients with good oral hygiene who have lost teeth due to parodontosis, unsuccessful treatment of teeth, trauma or any other reason.Embeding dental implants to avoid the adjacent teeth grinding, which is necessary during the construction of bridges, and in this way, it is physiologically and functionally more usefull to use these modern methods to recover lost teeth, and the terminal loss of teeth, is the only option for obtaining fixed teeth. MDI - mini-dental implant - simple solution for a complicated situations Mini dental implants are made out of aspirations to give patients with the large bone atrophy comfortable and stable carrying of the denture. This is a long lasting solution that gives immediate results.